The Canon EOS 6D is the latest of Canon's full-frame DSLR cameras. Its impressive array of advanced capabilities allows the photographer more influence over the final image. 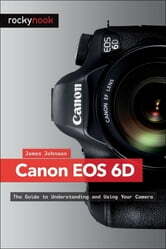 This book's exploration of the EOS 6D goes beyond that of the user's manual. It provides illustrations, step-by-step setting adjustments, helpful suggestions for setup, and detailed explanations for each of the camera's many features and menu configurations. The text is illustrated with easy-to-follow screenshots and example images. This book will also introduce intermediate-level camera users to DSLR model-differentiating features: built-in GPS and Wi-Fi. The content covers effective use of the camera's hardware (and some software) as well as certain related accessories, with little emphasis on general photography. Author James Johnson covers everything from basic camera features to advanced photographic options. With this book as your guide, you'll learn to successfully use this powerful camera.